Despite their name, tea sandwiches fit the menu whenever you're looking for a snack simple to serve and easy to eat. For special events such as baby showers, engagement parties, bridal showers, cocktail parties, initiations and even birthdays a couple of tea sandwich options often create an elegant and elevated setting for your guests. Guests might be dressed for the occasion and actually prefer something light to snack on to keep tummies trim and clothes clean. Tea sandwiches are amazing paired with tea cookies for your event. Both are bite-sized and great for presentation. They are so sweet atop a traditional tiered tea party serving tray. Your guests will be so impressed with your classy affair and that you took the time to experiment with the nostalgic small bites. Often a little research and decor go a long way when planning your event. Mix and match china and glassware looks incredibly chic and sophisticated with your tea inspired menu. Don't forget the tea either! Have both coffee and tea on hand for guests who prefer both. Tea is the traditional drink of ​choice at this kind of event but some guests may prefer some espresso with their tea sandwiches. When you plan your tea sandwich menu, let your imagination run wild. As much as the traditional white bread, cucumber sandwiches are still popular, any kind of bread and topping is possible. Think of your favorite toppings and simply scale them back to a more delicate package. Here's an assortment of ideas to get you started. A thin coating of butter will keep the bread from getting soggy. It's important to use good quality bread to help maximize the flavor and texture of each bite. The bread should be thinly sliced, ends trimmed, and cut into small pieces, generally no larger than a two-bite size. If you want to keep things traditional for your affair I would suggest these classic tea sandwiches which people know and can rely on. Personally, I love a cucumber and cream cheese tea sandwich but smoked salmon comes in a close second. Can't wait to try a tuna salad tea sandwich topped with capers. If you are looking for a more meaty sandwich often pate or Italian cured meats offer a great solution for meat-lover guests. Always have a vegetarian option available for those with diet restrictions and possibly allergies. My go-to would be a hummus tea sandwich but feel free to experiment. Seafood tea sandwiches are a little pricier but so much fun! Love a fresh seafood topping for entertaining. 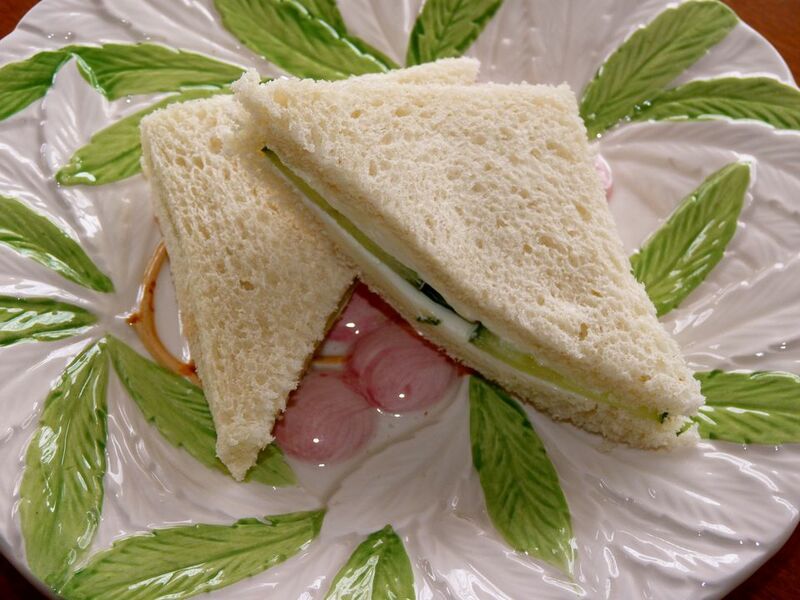 Roseville Tea Sandwiches - a combination of cucumbers, smoked salmon, horseradish, and herbs. Smoked Salmon Tea Sandwiches - uses ginger-cilantro lime butter for an interesting twist.